Preheat oven to 400 degrees. On a floured surface, roll the puff pastry into a 16-by-10-inch rectangle. Trim uneven edges. Place pastry on a baking sheet. With a sharp knife, lightly score pastry dough 1 inch in from the edges to mark a rectangle. Using a fork, pierce dough inside the markings at 1/2-inch intervals. Bake until golden, about 15 minutes. Remove pastry shell from oven, and sprinkle with Gruyere. 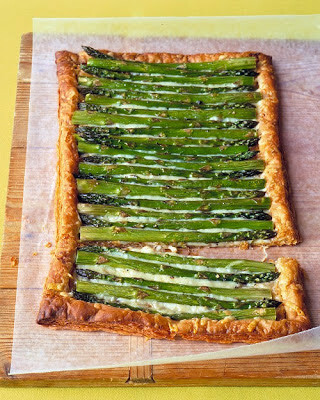 Trim the bottoms of the asparagus spears to fit crosswise inside the tart shell; arrange in a single layer over Gruyere, alternating ends and tips. Brush with oil, and season with salt and pepper. Bake until spears are tender, 20 to 25 minutes. 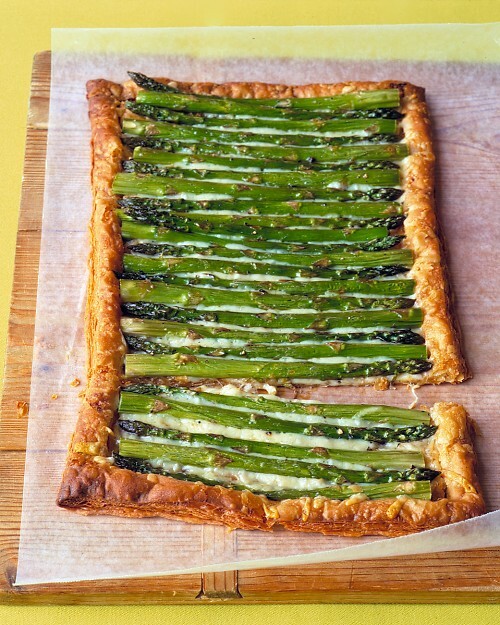 Store-bought puff pastry works well in this savory tart; thaw it according to package instructions. Emmentaler or Fontina cheese can be substituted for the Gruyere.